The Gulf of Maine herring fishery is coming under scrutiny this year. Last fall, the Herring Alliancea coalition of environmental groups and some fishermenran a campaign urging New England residents to voice their concerns about the fishery, such as fishing practices, to bolster support for making it a priority fish to protect. As a result, the New England Fisheries Management Council (NEFMC) received some 8,000 public comments by email. In November 2007, the NEFMC voted to reexamine herring regulation, adding the species to its 2008 management priority list. The council made an important decision today to fix the Atlantic herring fishery, Baker said in a statement issued immediately after the NEFMC vote. Yet not everyone agrees the fishery is broken. Herring have long been important for humans as well. Traditionally, they were harvested from fixed-gear traps called weirs, or caught in purse-seine nets drawn around their schools as they surfaced at night to feed on plankton. In parts of Canada, such as the Bay of Fundy, herring harvest methods are still fairly traditional, said Gary Melvin, a herring scientist at the Canadian Department of Fisheries and Oceans Biological Station in St. Andrews, New Brunswick. In U.S. waters, on the other hand, the face of the herring fishery has changed. 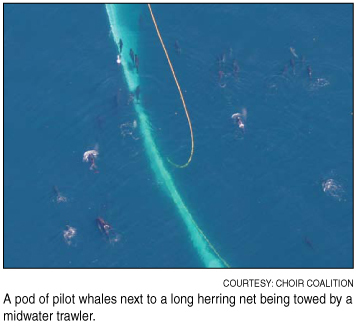 In the last decade or so, large boats known as midwater trawlers have become the normand the source of much of the current controversy over the fishery. Herring fishermen argue that theyre abiding by management rules, and that no evidence of a bycatch problem exists. Herring swim high in the water column, they point out, and the trawl nets dont come anywhere near the seafloor, where groundfish such as cod and haddock spend most of their time. Furthermore, they said, the NEFMC just implemented new regulations in the summer of 2007. Under the new amendments, only fixed-gear and purse-seine fishermen can harvest herring in the inshore area between June and September. Mary Beth Tooley, a spokesperson for the Small Pelagics Group, which represents fishing vessel owners, said its too soon to know if the new amendment will have a positive effectand its unfair to saddle fishermen with additional regulations in the meantime. They have no new information from the last go-around, she said. The Herring Alliance is calling for the NEFMC to create a monitoring system that ups the number of observers on herring boats. But thats easier said than done. In 2005, observers were present on about 20 percent of herring fishing trips, Steele said. The last two years, that number has been much lower. Observers are funded by the National Marine Fisheries Service, she said, and NMFS has to prioritize the budget its handed by Congress. For the record, stressed Tooley, were not against increasing observer coverage. Rather, she said, the industry resists the idea put forward by some environmentalists that boat owners should pay upwards of $1,000 a day to fund observers themselves. We dont think its fair to single us out among all the fisheries and say you have to have your own observers, she said. Once upon a time, most of the herring netted in the Gulf of Maine ended up in sardine tins. Today, only one cannery remains in New England. 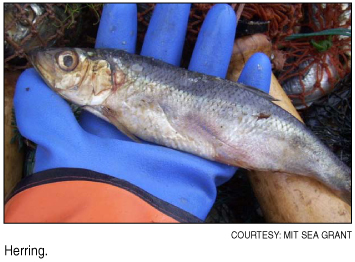 Some 60 to 80 percent of herring landings return to the sea as lobster bait. The fish are so popular as bait, in fact, that Gulf of Maine Research Institute scientists are now investigating whether all that herring bait has fueled the growth of the lobster population in the Gulf of Maine.